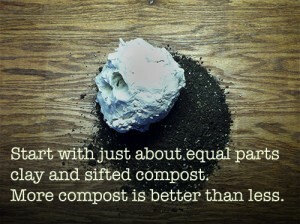 Compost provides nutrients and holds moisture. You can use potting soil instead of compost. The clay helps buffer the intense chemistry of the compost and also serves to bind the seed balls together. The exact ratio is not critical as long as it forms well. 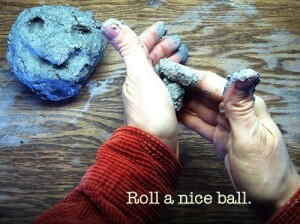 You can start with moist or dry clay. Clay can be red or white. Red clay stains more. Great tip: Keep dust down by mixing dry clay outdoors, or inside sealed plastic bags, adding water a bit at a time. Large seeds can be deep inside the seed balls. Small seeds should be near the surface of the seed balls- they won’t be able to break out from deep inside a seed ball and may need light to germinate. Too many seeds in each ball will over-crowd the plants. 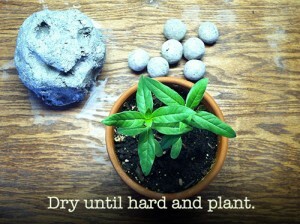 Plan on one plant per ball- so just a couple-to-a-few seeds per ball. Article. Don’t make the seed balls larger than a quarter. Article. Heads Up! Many Seed ball recipes that you will find online call for large quantities of seed. This is wasteful and makes the activity much more expensive than needed. Plants that grow will be over crowded and none will thrive if this practice is followed. There are many ways to make seed balls. Although I think this method is one of the easiest that generates very effective seed balls, others do work as well. You can change the proportions to suit your needs and the availability of supplies. Here is where you will find the greatest variation among recipes. Our seed balls have a very high amount of compost and fewer seeds than most. This makes them a little harder to make, but I think it pays off. The recipe below, will make seed balls that will form nicely, but have a high enough compost content for smaller seedlings to penetrate easily. You can try different proportions as suits your needs. In our expertly made commercial seed balls, we use a ~4:1 ratio of compost to clay, emulating the top layers of soil where seeds prefer to germinate. Moisten clay. Mix clay with water until it is the consistency of yogurt or soft-serve ice cream. 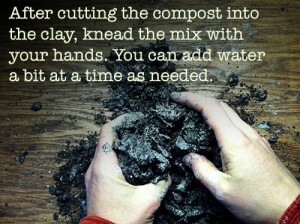 Mix with sifted compost in a 1:1 ratio clay:compost by volume. 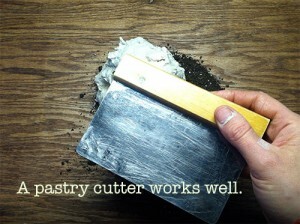 I cut the clay into the compost like creaming butter and sugar together, then I wedge like clay or dough. Add water so that the matrix is workable enough to make balls hold together, but not sticky. 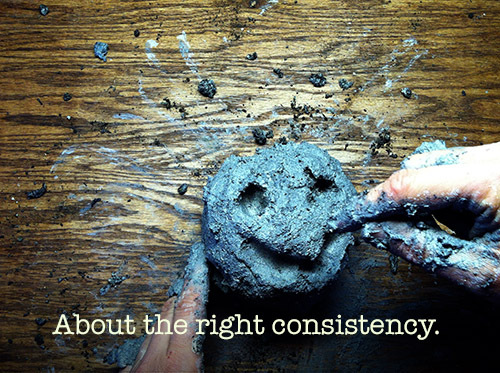 If it’s too sticky, mix in some sifted compost until you have the right consistency. 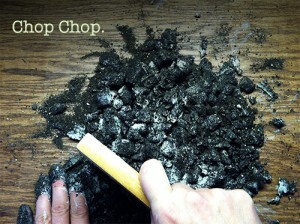 Pinch a seed-ball’s worth of matrix off of your prepared clump. Add some seeds. If they are easy germinators, 1-2. 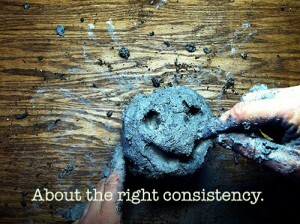 If they are stubborn, add some more. You don’t want 8 germinating seeds in one seed ball. That will stress the seedlings and none will thrive. Air dry at room temperature until the batch is uniformly light color. If you are using hardened clumps of clay, you can crush them with rocks or a hammer and mix with water. For a less dramatic solution, you can slake clay in water. Fill a five gallon bucket with chunks of dried clay, then fill it with water about 2/3 the way up. Let it sit for a couple of weeks. We stock seed ball supplies! 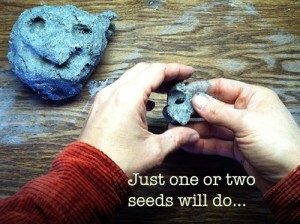 Try our Advanced Seed Bomb Recipe.